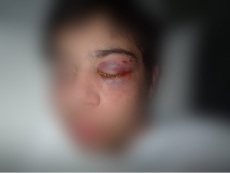 The injuries suffered by the 19-year-old victim after the March 27 assault. PERTH Detectives are still hunting the man who attacked a teenager in a carpark on Murray Street late last month. The 19 year-old victim was assaulted in the early hours of Sunday March 27, leaving him with a fractured cheek bone. He was with his brother in a Wilson carpark opposite a nightclub about 3.30am when a man who has not yet been identified assaulted him. The attacker was described as having short dark hair, a tanned or brown complexion, and about 180cm and wearing dark-coloured clothing. There were several people in the area at the time and police are calling on anyone who witnessed the attack, or the offender leaving the scene, to contact Crime Stoppers on 1800 333 000, or report the information online.